Largest Selection in the NW. 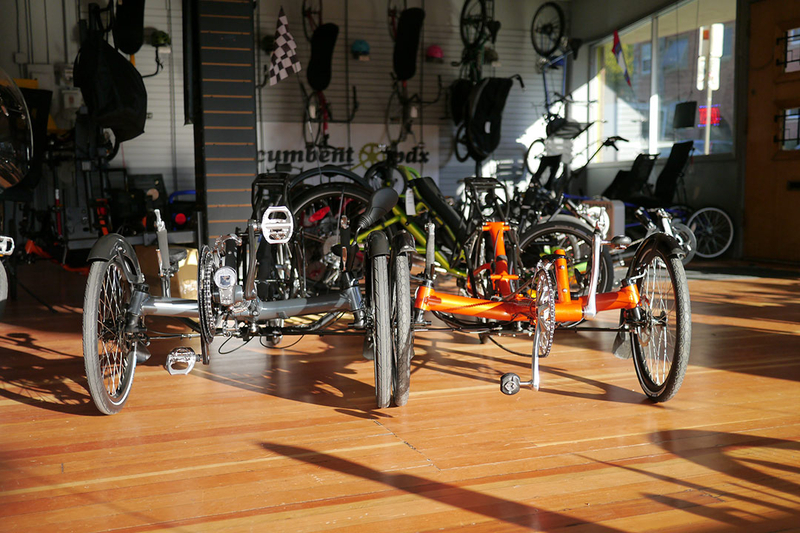 With over 150 recumbents in stock, RecumbentPDX has the broadest selection and the largest inventory in the Western United States. We have over 30 test ride models from Catrike, HP Velotechnik, AZUB, Greenspeed, and SUN –including electric-assist and adaptive trikes- on our showroom floor ready for you to test ride. We’ll discuss your history, needs, budget and desired to ride and then get test models fitted for you to ride. Our fantastic mechanics perform repairs and tune ups on all recumbents and we stock all the accessories you need to enjoy your time out on the road. 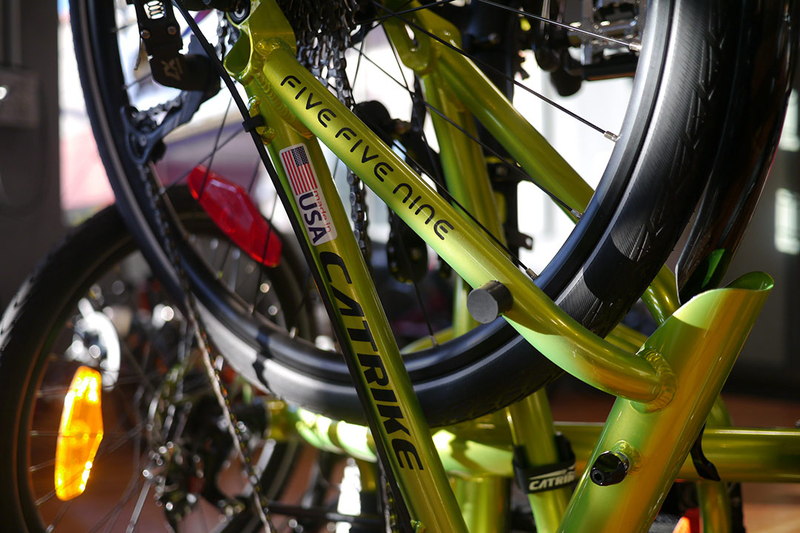 Our large inventory often ensures that we can have the exact model in just your color ready for you to ride today! 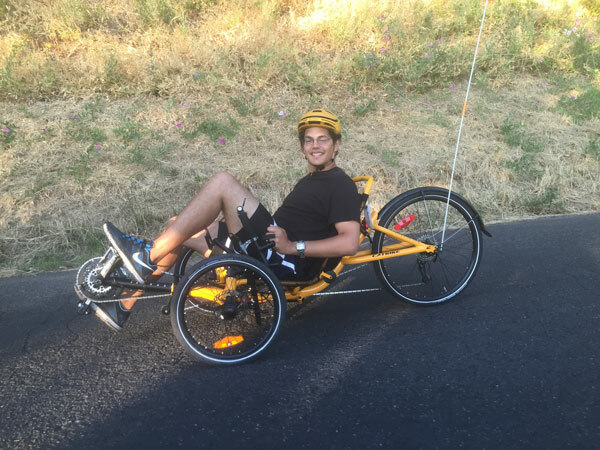 If you’re recovering from injury, Recumbents are perfect therapeutic alternative –And They’re Fun! If you’re looking to shed some unwanted pounds, Recumbents Trikes and Bikes can help you get there –And They’re Fun! If you’re living with Parkinson’s or recovering from a stroke or TBI, trikes provide safe, adaptable mobility –And They’re Fun! If pain in your neck, back, shoulders, wrists or, um.. seat relegates your beloved Bianchi road bike to a hook in the garage season after season, recumbents may just be the ticket to get you back on the road – And They’re Fun! Learn how recumbents can benefit you. Take a test ride in Portland Oregon. Read about how we get you the right recumbent. RecumbentPDX has the broadest selection and the largest inventory of Recumbent Bicycles and Trikes in the Pacific Northwest. I came to the shop knowing nothing about recumbent bikes or trikes and was apprehensive about starting a dialogue with the salespeople. The very friendly staff put me at ease and encouraged me to take a test ride. The ride was wonderful! The bike expertly adjusted for me –even though I was just testing. The staff understood that to make a purchase there were many questions I needed to ponder and they patiently and competently walked me thought the process. I ended up feeling the staff weren’t salespeople but consultants — truly a pleasant and helpful experience! The staff at RecumbentPDX were very helpful in assisting me with zeroing in on the make and model of recumbent trike that best fits my particular needs. The store has been recently updated, stocked with inventory, and is ready for business. The trike I chose (Greenspeed Magnum) was assembled in minutes including the accessories selected. As a novice to bicycling, I was given a tremendous amount of information about the use and maintenance of the Magnum trike. Overall, my experience at RecumbentPDX was extremely positive and I would highly recommend this store to anyone, young or old, novice or pro, that is in the market for a new recumbent bike or trike. Great recumbent bike shop! Friendly staff. Mel is awesome and a wealth of recumbent knowledge and resources. Go in and take a test ride and you’ll never ride upright again! If I could do 10 stars I would. Melvin at RecumbentPDX is the sweetest most knowledgeable guy on recumbents. Fantastic customer service! I was new to recumbent bikes and had a lot of questions to find a bike that works for my needs. Wife and I recently had the pleasure of shopping for two recumbent trikes at pdx and could not have been more pleased with the very knowledgeable and very friendly folks we met there. Upon entering the store, my girlfriend and I was greeted by the entire staff. The store had a very pleasant layout and all the bikes were beautifully displayed like art pieces. As a recumbent aficionado for many years, I could not have been more impressed with the folks at Recumbent Pdx. I purchased my Velo Scorpion Plus three years ago from Recumbent PDX and Mel and Janet personally delivered it to me in Whitefish, Montana. That’s what I call “above and beyond”. I absolutely loved my experience. I have spinocerebellar ataxia and they were able to adapt a trike to my needs. The customer service and individual attention was amazing. Love my new recumbent! It has given me so much joy. Great shop run by knowledgeable people. I always get wonderful service. We had the BEST experience with recumbentpdx!!! They went out of their way to help us with a bike for my husband, making his dreams come true to bike around Sunriver! He can’t walk or talk and biking is his freedom!! We thank everyone there for their kindness to us and for accommodating Dave!! We just purchased two Catrikes from this marvelous shop. Mel and Janet couldn’t have made it a more pleasant buying experience in every way. Thanks to Mel, his wife and especially Louie for the great experience purchasing my new trike. It’s hard to put into words what a wonderful shop this is. Recumbent PDX is a fantastic store. We came all the way from Alaska to try out bikes and figure out what would work. They have a huge selection of trikes, and we got exactly what we wanted all set up to our specs within an hour of making a final decision. The test drive is a great way to try the bikes first – and a lot of fun. You will be glad you went! 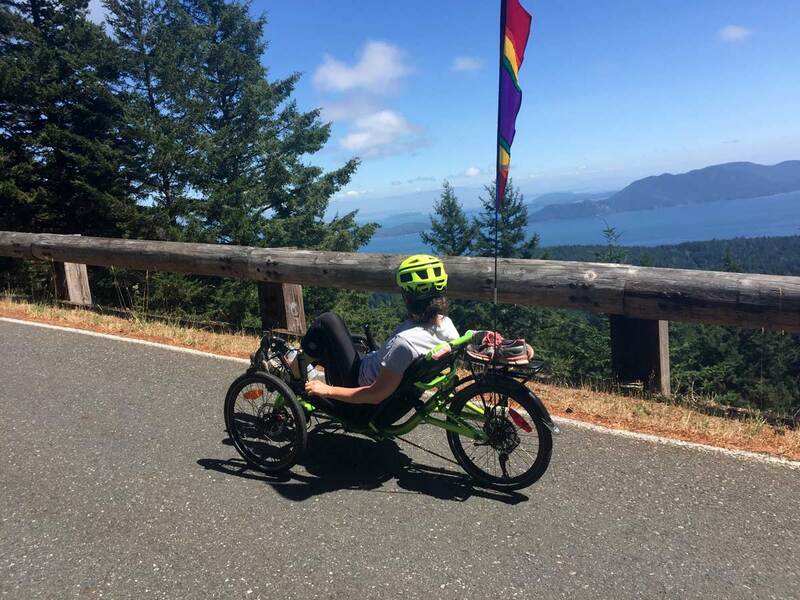 If you are looking for a recumbent trike or bike and you are in the Pacific Northwest, look no further. What a fantastic shop! The quality and assortment of merchandise are great and the staff are incredible! Very knowledgeable and helpful, patient, too … and what’s more, they made us feel welcome the moment we walked in. I traveled to Portland from Bellingham to test ride recumbent tadpole trikes and couldn’t be happier that I did. I recently purchased a Catrike 559 from Recumbentpdx. I can’t say enough about the friendly staff and their level of expertise. My goodness, does Recumbent PDX know about customer service. I felt more like a member of a family than a customer. The best possible service ever. Everyone in the shop is helpful and knowledgeable. So many recumbents to test ride and choose from. The folks in this shop are the best of the best—friendly, helpful, knowledgeable. I had a great experience at Recumbent PDX. Mel is amazing. Very knowledgeable and then some. Janet, Mel, and Louis are the friendliest, most knowledgeable, and most dedicated people you will ever meet when it comes to helping you explore whatever your needs might be! RecumbentPDX…the place to go if you want excellent choices of recumbents, excellent advice on which is right for you and excellent follow up after you’ve gone out the door and home. Thanks to Mel, Louie and the anonymous mechanic’s in the basement for their efforts in getting us ready to go during a whirlwind trip to Portland! 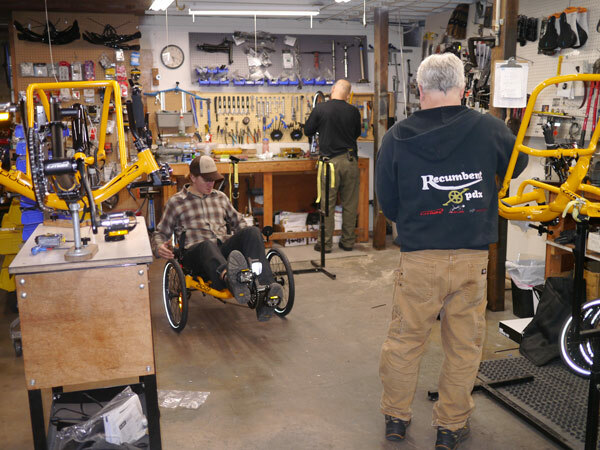 The folks at Recumbent PDX were knowledgeable, helpful, easy to work with, and answered all our questions. You won’t find a better crew than this group!! Great selection and really knowledgeable people. The staff and service was A++. I highly recommend recumbent PDX to anyone who thinks riding a bike isn’t fun because it will blow your mind it brings the fun back into riding. Great fun working with the owners of RecumbentPDX. Took the time to get to know what the issues were medically that we were working with and to find out what our goals were for riding. I loved that they let us take the trike out for as long a ride as we needed to make sure we were getting what we wanted. My husband and I could not be more thrilled with our Recumbent 559 Catrikes. The staff and owners of Recumbentpdx are very professional and helpful with helping us become experienced recumbent trike riders. Their service is above and beyond what we expected. Would encourage you to go to Recumbent PDX and try them out. You will be hooked! 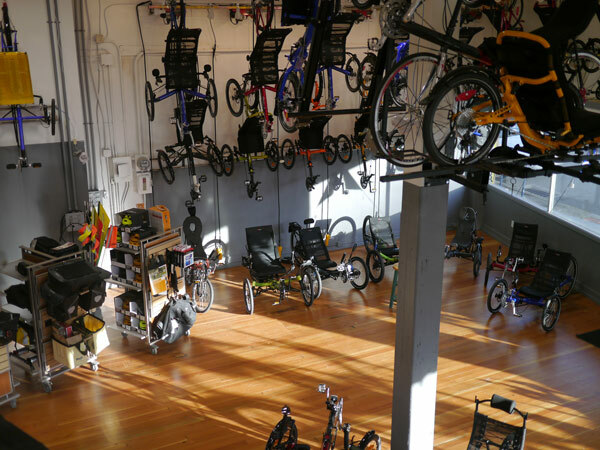 RecumbentPDX is an example of how a store should be…helpful, courteous, personable. No pressure, just an interest in helping the customer find the right trike. Thanks. My husband loved my recumbent so we went down to Recumbent PDX and he got exactly what he wanted. This place is the cat’s meow! Truly the recumbent bike and trike center of the universe! Best inventory and best customer service. Patience and knowledge are second to none. The folks who own this bike store really have customer service nailed. Here are Tom and Becky's Catrike 559, new equipped with pedal-assist electric motors, on their way home to Missoula Montana! Stopped in to try a recumbent trike. Mel greeted us the door and went out of his way to assist me in making an informed decision. I took a Catrike Villager for a ride. Easy to peddle up hills and crazy fast on the down hills. I've been to 3 other bike shops that have recumbent trikes. The only shop that has a real selection and knows what they are talking about. If you're thinking about a recumbent don't waste your time at another shop. Go See Mel! Thank you to Janet, Mel and their son Mark for spending a full day with us test riding trikes until my wife and I found the perfect ones! Also thanks to Louie for making sure the trikes fit perfectly, installing all our accessories and explaining the maintenance routine. These things are a blast! The selection of recumbent trikes is unsurpassed in the area. People there are very nice and will take plenty of time with you. Service is a little rag-tag, and things do get dropped in communication at times. Overall, I would definitely recommend it, but do not expect a polished feel to the experience. Spent 3 days working with this amazing team. They helped me test ride every option I was interested in and provided friendly and attentive help. We drove down from Seattle and it was worth every mile. There are recumbent dealers in the Seattle region but the experience is worth the trip. They are happy to answer any question and have a huge selection of the best and safest recumbents around, where you can grab your helmet or barrow one of the shops and go test ride. The days of old and slow recumbent bikes are in the past. These things are just as fast and easy to hill climb on as any road bike. Thanks again you guys. See you soon to get the wife's picked up.